What’s the best deep cycle battery for my RV? Is one of the most frequently asked questions on Mozaw. To answer this, we’ve reached out to the large community of full-time RVers to learn which deep cycle batteries they use and why, and to find out about their battery replacement experiences. The deep cycle battery is the most important component in any RV’s electrical system. It provides the juice to run all of your RV’s appliances and electronic devices when there is no 110-volt power supply. Without power from deep cycle batteries, there is no way to pump water into your RV’s fresh water tank, no way to run your electric fan or refrigerator during the hot summer months, and also no way to run your electric space heater to keep your RV warm over the winter. After all, everything in your RV needs electricity to function and the deep cycle batteries system is your RV’s heart and soul. What’s the best generators for RVs & travel trailers? What’s the best and quietest RV air conditioner to buy? Yet despite that, many owners do not really understand the importance of choosing deep cycle batteries for their RV and how to maintain them properly. Even when the best deep cycle batteries are installed in your RV, you may not get the most out of them if you don’t know how to connect multiple batteries together to achieve the correct battery voltage or capacity for RV applications. That’s why we’re here to help. By reading the information below you are already setting yourself apart in a way that will help make your RV experiences in the future run smooth as a whistle. In this guide, we’ll give you everything you should know to choose the best deep cycle batteries for your RV. We’ll give you our in-depth reviews on some of the best RV batteries on the market that you should buy. Then we’ll share some tips on how to connect your batteries together as one big battery bank to make them more efficient and ensure maximum service life. And finally, some MUST-KNOW battery charging tips from experts that you won’t find anywhere else. What’s an RV Deep Cycle Battery? In today’s RVs everything relies on deep cycle batteries, from portable coffee machines or small water pumps to large appliances such as microwaves, TVs, air conditioners, and refrigerators. They are designed to provide a steady amount of current over a long period. The deep cycle battery differs from the starting battery which is designed to deliver high bursts of energy for short periods to crank the starter of the engine (car, truck, boat, etc). An RV deep cycle battery is designed to discharge between 50% and 70% of its capacity, depending on the manufacturer and the construction of the battery. When the batteries are recharged, energy is re-deposited into the bank, and the process, or cycle, starts over. Compared to a starting battery, a deep cycle battery has much thicker plates and they are solid, not a sponge. These thicker plates have less surface area and thus less of the instant power that a starting battery needs. They are designed to be discharged down to 20% of their maximum charge repetitively. The thicker lead plates allow for this as they are much sturdier than their sponge counterparts. Deep cycle batteries are also used to power small vehicles, such as electric wheelchairs, golf carts, and marine applications. For marine applications where both engine starting and light deep cycling are required, dual-purpose batteries are often used, commonly known as deep cycle marine batteries. This battery type is neither a starting nor a deep cycle battery but rather a compromise between the two so it performs both functions adequately. 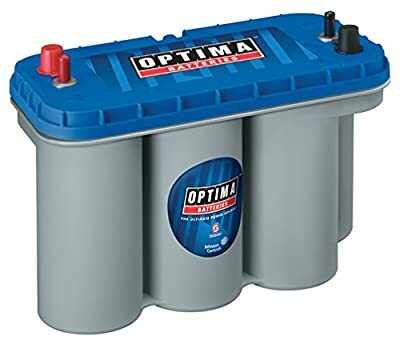 We generally advise that you choose only true deep cycle batteries for your RV to get the best performance and battery life, though there is a dual-purpose battery model that works very well in any RV application and even solar power system – the Optima BlueTop Starting and Deep Cycle Battery. This is one of the top-rated RV deep cycle batteries on the market, and for good reasons. Deep cycle RV batteries are made of three different common types: Flooded Lead Acid, Gel Sealed, and Sealed Absorbed Glass Mat (AGM). There is no one best battery for all RV applications. Each has its own advantages and disadvantages. Flooded or “wet” batteries are the most cost-efficient and most widely used batteries in RVs and solar systems, but they require regular maintenance and need to be used in a vented location. AGM batteries are costlier than gel or flooded cells but last considerably longer and are maintenance-free. The BEST RV battery is not always the most expensive, but it’s seldom the cheapest either. Understanding and comparing are the keys to know which is the right one for you. Flooded lead acid batteries, also known as wet cells, are based on the lead-acid chemistry discovered in 1859 by Gaston Planté, and are also the most popular type of deep cycle batteries in use today for RV applications. The term “flooded” is used because this type of battery contains a quantity of electrolyte fluid so that the plates are completely submerged. Flooded batteries consist of lead and lead-oxide plates surrounded by an electrolyte, a mixture of sulfuric acid (H2SO4) and water (H2O). Taking electricity out of the battery (discharging) causes the plates to change to lead sulfate, and dilutes the electrolyte. Putting electricity into the battery (charging) forces the sulfate coating off the plates and back into the electrolyte, making it more concentrated, and the plates return to lead and lead oxide. Hydrogen and oxygen gas are released during charging as some of the water molecules in the electrolyte break apart from electrolysis. Vented wet cells allow the gases to escape into the atmosphere, unlike gel and AGM batteries, which recombine the gases and re-introduce them to the system. Hydrogen is an explosive gas, so battery boxes and compartments must be vented to let the gas escape safely. Personally we don’t think flooded lead-acid batteries are the best deep cycle batteries for an RV. They do require regular maintenance, off-season charging, must be installed in an upright position and don’t tolerate high amounts of vibration. But this type of deep cycle batteries really has a lot going for it. Flooded batteries handle overcharging better than gel and AGM deep cycle batteries, because of this hydrogen venting and because they are not sealed like the other types. They usually have the longest life and the lowest cost per amp-hour of any of the other choices. They require regular maintenance in the form of watering, equalizing charges and keeping the terminals clean but if you spend an hour per year to take care of them, everything would be fine. Their initial cost is lower than similarly sized AGM or gel batteries, and MUCH lower than the new type of lithium batteries. Flooded batteries average about 20% loss. For every 100 Watt-hours you put into the battery, you can pull about 80 Watt-hours back out. But even with a fair loss in efficiency and the need for eventual replacement, this is the best energy storage solution for the price. A typical flooded lead-acid battery can be expected to last 5 to 7 years if you maintain it regularly but some cheap units might fail only after 3 years of regular use. You should buy your batteries from some American trusted names such as Trojan, Interstate Batteries, and Rolls Surrette. Trojan Battery Company is the world’s leading manufacturer of deep-cycle batteries and their deep-cycle flooded batteries are the best batteries for RVs today. The Trojan Golf Cart 6-Volt Flooded Lead-Acid Battery is the most widely used deep cycle battery by professional RVers. With this battery you can expect it to last up to 10 to 15 years and even more if you maintain the battery every year. AGM deep cycle batteries are perfect for most applications. These batteries are the best deep cycle batteries for trolling motors, boats, Harley Davidsons, trucks and recreational vehicles. They are nearly always better, stronger, tougher and less maintenance than flooded batteries. Absorbent Glass Mat (AGM) technology became popular in the early 1980s as a sealed lead acid battery for military aircraft, vehicles and UPS to reduce weight and improve reliability. The AGM battery is a type of lead-acid battery in which the electrolyte is absorbed into a fiberglass mat. You will find that the plates in an AGM battery are flat like flooded lead-acid batteries, or they may be wound into a tight spiral (like Optima batteries). The internal resistance of AGM batteries is lower than flooded cells; they can handle higher temperatures and self-discharge more slowly than other types of batteries. AGM deep cycle batteries differ from flooded batteries in that the electrolyte is held in the glass mats, as opposed to freely flooding the plates. Very thin glass fibers are woven into a mat to increase surface area enough to hold sufficient electrolyte on the cells for their lifetime. The fibers that compose the fine glass mat do not absorb nor are they affected by the acidic electrolyte. These mats are wrung out 2–5% after being soaked in acids, prior to manufacturing completion and sealing. AGM deep cycle batteries are a great choice for vehicles with large power demands like RVs & motorhomes and for those who seek greater reliability and longer life in RV deep cycle batteries. One of the biggest advantages of an AGM deep cycle battery is that it’s maintenance-free. While a flooded lead-acid battery requires regular maintenance and needs a topping charge every six months to prevent the buildup of sulfation, an AGM deep cycle battery is less prone to sulfation and can sit in storage for longer before a charge becomes necessary. Even after 12 months sitting idle as long as it has been cared for, it can be recharged and put back into full service without any major damage. For those reasons, AGM deep cycle batteries are the best choice if you don’t want to do the needed maintenance. Other leading advantages of AGM are a charge that is up to FIVE times faster than the flooded version. AGM offers a depth-of-discharge of 80 percent; the flooded, on the other hand, is specified at 50 percent DoD to attain the same cycle life. The AGM battery is also able to be installed in any orientation and stand up well to very LOW TEMPERATURES. So if you often use your RV & motorhome during the winter months, AGM deep cycle batteries are a perfect choice. However, AGM batteries are sensitive to overcharging. The charging of AGM deep cycle marine batteries is different to that of the car battery. The voltage required to charge them is greater, therefore you will need to replace the original car battery charger if it is not programmable to charge AGM batteries. Read More: How to choose the best charger for my deep cycle battery? What’s the best AGM deep cycle battery for an RV? There are some of the best AGM batteries for the RV that we think you should buy. 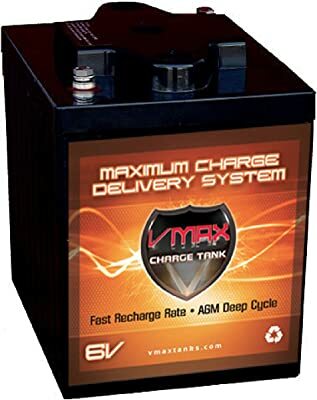 Vmaxtanks 6-Volt AGM Deep Cycle Battery, Lifeline AGM Deep Cycle Battery and Optima BlueTop. Our favorite option is the Vmaxtanks 6-Volt 225Ah AGM Deep Cycle Battery – this is recommended for accessory-heavy vehicles, or for vehicles running a lot of battery-draining electronics like RVs & trucks. Gel batteries actually predated the AGM type but are losing market share to the AGM’s. They have many of the same advantages over flooded lead-acid batteries including ease of transportation, as the AGM type, except the gelled electrolyte in these batteries is highly viscous and recombination of the gases generated while charging, occurs at a much slower rate. This means that they typically have to be charged slower than either flooded lead acid or AGM batteries. If charged at too high a rate, gas pockets form on the plates and force the gelled electrolyte away from the plates, decreasing the capacity until the gas finds its way to the top of the battery and is recombined with the electrolyte. Generally speaking, Gel batteries tend to have narrow charging profiles and can be damaged easily by charging them inappropriately. Because of that, Gel batteries are NOT the best RV batteries and shouldn’t be used if you don’t have considerable experiences of working with batteries and battery chargers. But compared to AGM batteries, GEL batteries are ideal in tougher situations where there are extreme temperatures and vibrations. A Gel battery is also much more expensive than an AGM battery of the same capacity. Gel batteries are more common used in solar power applications. If GEL batteries are your choice, we’d recommend the Renogy’s deep cycle batteries (6V-12V, 100Ah-260Ah). These are the best option to purchase at this time because these GEL batteries have a very good quality at a very competitive price. There are more than a few good reasons Lithium far exceeds the performance of Flooded Lead Acid & AGM batteries. A lightweight option which offers charging efficiency and between 3000-5000 life cycles makes Lithium the best choice for a better battery. Showing high performance in both extreme heat and cold, Lithium is about 2.5 times more efficient at low temperatures and operates safely up to 149*F. Furthermore, versatile mounting allows for your battery to be installed in any direction with the same consistent energy flow throughout the duration of use. Despite higher upfront costs of Lithium deep cycle batteries, the savings are clear when considering the true lifetime value. There are several types of lithium-ion, but you should only use Lithium Iron Phosphate(LiFePO4) for your RV. It’s totally SAFE, won’t burn or explode, stable and maintenance-free for 15 to 20 years. It offers good electrochemical performance with low resistance. This is made possible with nano-scale phosphate cathode material. The key benefits are high current rating and long cycle life, besides good thermal stability, enhanced safety and tolerance if abused. LiFePO4 is more tolerant to full charge conditions and is less stressed than other lithium-ion systems if kept at high voltage for a prolonged time. LiFePO4 deep cycle batteries have a very constant discharge voltage. Voltage stays close to 3.2 V during discharge until the cell is exhausted. This allows the cell to deliver virtually full power until it is discharged. And it can greatly simplify or even eliminate the need for voltage regulation circuitry. Because of the nominal 3.2-Volt output, four cells can be placed in series for a nominal voltage of 12.8 V. This comes close to the nominal voltage of six-cell AGM or flooded lead-acid batteries. And, along with the good safety characteristics of LiFePO4 batteries, this makes LiFePO4 a good potential replacement for lead-acid batteries in RV applications. What’s the best Lithium-ion deep cycle battery for the money? One of the best RV lithium batteries for the money is the Battle Born 100Ah LiFePO4 12-volt Deep Cycle Battery. We can tell you that this battery is AMAZING. It’s very light, only 29 lbs, can be wired in series up to 48V and unlimited in parallel, and designed and assembled in Nevada, USA. What is the best RV battery size: 6 volts or 12 volts? Some say two 6 volt batteries are better than two 12 volt batteries, how do you think? A 6-volt battery for RV is actually a “golf cart” battery. 6V golf cart batteries are one of the most versatile batteries readily available for either a small home, cabin or for someone just starting to live off the grid. If you think these 6-volt batteries have no place in the world of RV with the 12-volt storage system, then think again. They are a perfect choice for your RV and can be much more cost-effective than 12-volt batteries in the long run. To explain it in cost-effective detail, first let’s look at the inside of each battery size. Both contain 2.1-volt cells. Three cells in the 6-volt battery and six cells in the 12-volt battery. The 6-volt battery has more space per cell than the 12-volt hybrid so the plates are thicker and will last longer. The 6 volt will be able to discharge deeper than any 12-volt deep cycle. In fact, most 12-volt deep cycle RV batteries are not true deep cycle, they are a hybrid between a deep cycle and a starting battery but most 6-volt golf cart batteries are. In addition, if you have only two batteries (6V batteries in series or 12V batteries in parallel), placing them in series provides a more effective charging capability and assuming that the physical size of the two batteries is about the same, you will have roughly the same amount of power capacity in watts with either configuration. But series cells will all charge to full capacity even if one is not as good condition as the others, while parallel cells will only charge to the level of the weakest cell. Based on our own experience, two 6 volt batteries will give you lot higher amperage than one 12V battery. If your RV lifestyle is traveling park to park then two 12 volt deep cycle batteries just work fine. But if you plan on doing any dry camping or boondocking and need as much stored energy as possible, you should use four or even six 6 volt batteries. What’s the best 6 Volt Battery for RV? How to charge a 6-volt Golf Cart battery? The voltage required to charge a 6-volt battery is lower than that of a 12-volt battery, therefore you will need to replace the original 12V battery charger if it is not programmable to charge 6V batteries. 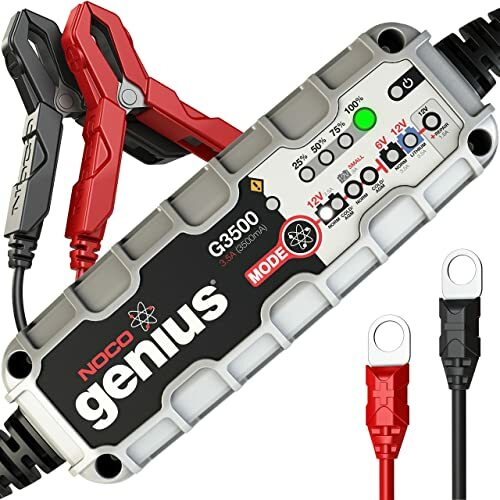 One of the best 6-volt battery chargers is the NOCO Genius G3500 6V/12V 3.5A UltraSafe Smart Battery Charger. If you’re choosing high-capacity deep cycle batteries for dry camping, the VMAXTANKS 6 Volt 225Ah AGM Battery may be what you want. It’s the best 6-volt golf cart AGM deep cycle battery currently available. While you can survive with just a few cheap flooded lead-acid batteries, you will enjoy the road less traveled more comfortably with VMAXTANKS. We recommend a minimum of 6 VMAXTANKS batteries if you plan on using almost everything in your RV with the battery. As for the amp hours, when you connect two of 6-volt batteries in series to get 12 volts, the voltage adds and the amp hours remain the same. So six of 225Ah 6V batteries in series/parallel configuration to make a 12-volt bank would give you 675Ah (3 x 225Ah) of which 500Ah would be available for use before you hurt them. Trojan invented the golf cart battery back in 1952, and ever since then has been making quality batteries that outshine their competition. 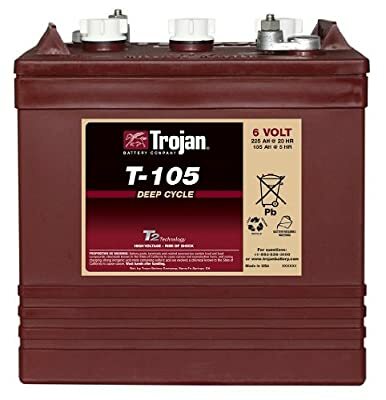 The T-105 6V golf cart deep cycle battery is Trojan’s flagship line and is a clean, reliable power source for golf carts, electric vehicles, RVs, marine, or anything mobile. This is one of the most popular RV deep cycle batteries and is trusted by many long-time RVers. The Trojan T-105 features Trojan’s historically-proven engineering with T2 Technology, an advanced battery technology for maximum sustained performance, longer life and increased total energy. T2 Technology helps the battery increasing both sustained capacity and total overall ampere-hours, resulting in more operating power for your application. It’s a key reason why Trojan batteries consistently outperform the competition. Trojan combines a thicker internal grid with their robust Maxguard T2 separator and high-density paste to create an exceptional battery that outperforms its competitors. Their advanced battery technology results in a longer battery life with lower maintenance costs, making it a great option for RVs that have a solar PV system. The most important characteristic to consider when purchasing a new deep-cycle battery for an RV is cycle life. Trojan T-105 batteries are good for 1200 cycles at 50% DOD and 800 cycle at 80% DOD – longer than almost any other flooded deep cycle battery in the industry. So you can probably expect your RV battery life to be about 10 years or even more. LiFePO4 lithium-ion batteries are the Safest, Strongest and most Reliable RV batteries on the planet. They outperform and outlast all other types of deep cycle batteries. 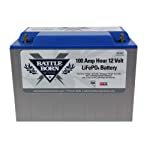 The Battle Born Batteries 100Ah LiFePO4 12-volt Deep Cycle Battery is 100% MADE IN THE USA and is one of the best RV lithium-ion batteries on the market. It weighs only 29lbs and is made from 100% safe, nontoxic materials. It’s designed to last 3000 cycles up to 100% depth of discharge, at which point the battery will still hold 75 to 80% of its energy capacity. For the amp hours, when you connect two of 12-volt batteries in parallel, the amp hours add and the voltage remains the same. So 4 of these 100Ah 12V lithium-ion batteries in parallel configuration to make a 12-volt bank would give you 400Ah (4 x 100Ah) of which 90-100% would be available for usage. Installing Lifeline GPL-4CT 6-volt AGM Deep Cycle Batteries in your RV means exceptional running time and more recharges than you’d get out of a traditional battery. It’s perfect for RVs with creature comforts that tend to drain batteries quickly. On top of providing outstanding vibration resistance, the Lifeline GPL-4CT efficient power delivery and faster recharge time mean you’ll spend less time worrying about your battery. This means more time for fun. Lifeline GPL-4CT 6V AGM batteries are hand-made in the USA (according to the company). They are high-quality products that are readily available nationwide and come with a good 5-year warranty. Most RVers rated it the top-of-the-line AGM batteries, but it’s slightly more expensive than others of the same capacity. Lifeline Batteries are manufactured in West Covina, California by the Concorde Battery Corporation – a US family owned and operated company. The Lifeline Battery technology is a direct spin-off from Concorde’s industry-leading aerospace battery lines. All of these batteries satisfy the rigorous demands from many branches of the US Military and a host of industrial and private sector applications. Therefore, Lifeline GPL-4CT AGM batteries are a perfect choice if you’re looking for a strong and reliable power source for your RV. What’s the Best Charger for RV Batteries? Charging RV batteries is a relatively complex subject for those who don’t have any knowledge about the battery. The most basic charging system is a “Converter” that converts 120V AC to typically 13.2V DC for the 12V DC systems in the rig. A converter is designed to provide lots of 12 VDC for various systems but is not a good battery charger. All the 12V DC systems in your RV are designed to operate satisfactorily on DC voltages between 10.5V to 15V. A converter provides 40 amps or more for these systems, but can only charge batteries at 3 to 5 amps. So if the only charging device you have is a converter, it can take many hours to recharge a depleted battery. The best battery charger for your RV deep cycle batteries is microprocessor-controlled chargers, also known as “SMART CHARGERS”. These chargers are designed to charge lead acid and other types of batteries based on computer-generated algorithms. Simply put, the charger collects information from the battery and adjusts the charge current and voltage based on this information. This allows the battery to be charged quickly, correctly, and completely when using a smart charger. 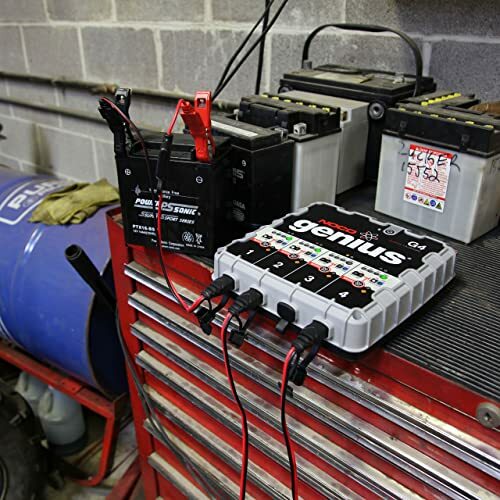 The fastest and most reliable smart charger for RV deep cycle batteries currently available is the NoCo Genius UltraSafe Smart Battery Charger. These battery chargers are available in many different sizes and voltages: 6V, 12V, 24V and 1 bank, 2 banks or 4 banks. NoCo chargers are waterproof, shock and vibration resistant rugged design can be mounted directly onto a variety of applications, including RVs, boats, trolling motor, as well as, a full range of electric vehicles and industrial equipment. They monitor battery activity of flooded, gel, AGM and lithium-ion batteries without the worry of overcharging. And this’s one of the most advanced charging systems designed for improved battery performance and longevity. Installing a battery monitor might be the best investment you’ve ever made in your RV. It shows charge state, voltage level, usage, predicted usage time left etc. The controller in this monitor calculates the amount of current being put into the battery bank while charging and taken out during discharging and thus calculate the charge state of the battery. The best battery monitor is the Victron BMV-700. This is the latest Amp Hour Meter from Victron Energy. It keeps track of current flowing in and out of a battery bank and uses a sophisticated algorithm to read out the state-of-charge of the battery in percentage remaining and amp hours remaining. It also displays Volts and Amps, time to go, and Consumed Energy and keeps track of Historic Data including Battery Efficiency, Average Discharge, Deepest Discharge, Number of Cycles, Overvoltage, and Undervoltage Alarms. A solar charging system is not complete without a charge controller. The charge controller is designed to do two primary things within an RV solar power system: optimize the charging of your RV deep cycle batteries by the solar panels and prevent electricity from the batteries from going through the solar panels when there is no sun. The best type of charge controller for the RV solar system is the maximum power point tracking (MPPT). This is an advanced charge controller that tracks power by measuring the voltage and adjusting the current to get maximum power transfer with prevailing light conditions. Some low-cost charge controllers on the market only produce an output voltage when sufficient light is available. With a diminishing light source, the charge controller simply turns off and resumes when sufficient levels of light are restored. Most of these devices cannot utilize fringe power present at dawn and dusk. These are some of the best MPPT charge controllers for RV that we recommend, but almost any modern controller will work fine. Exact model will depend on application and system size, amperage and voltage. Read More: What’s the best quiet RV generator on the market? Using a generator is the fastest way to charge your batteries when dry camping. Most generators have a 12V DC output built into them, however, trying to charge a battery using this is almost a waste of time. The 12V DC output is usually limited to around 8 amps the voltage can fluctuate and is not suited to effectively charge batteries. The FASTEST way to charge your RV batteries is to connect a Smart Charger to the 120V AC outlet of your generator. A smart charger uses 3 or more stages to charge the battery bank exactly the way it wants to be charged depending on its state. By upsizing the smart charger you can charge the battery at a much faster rate than the generator’s standard built-in unit. For example, if all you want to do when using a generator is to recharge the house batteries, you could use a portable 500 watt generator powering a 40 amp multi-stage charger (here we have 40 amp at 13.6 VDC), such as Xantrex TRUECharge2 12VDC 40A Battery Charger, and run it a few hours per day when the noise does not bother people. Obviously, with a 2,000-watt generator and a 125 amp charger, such as MAGNUM 3000W Inverter/125 Amp charger, it will take much less time to recharge the house battery system. If you want to use these high-amp 12VDC battery chargers to charge 6V golf cart batteries, connect two batteries in series as one big bank.